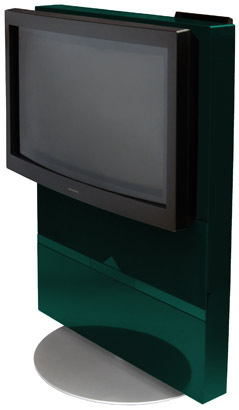 The BeoVision Avant was the first Beovision model to use a “widescreen” tube. The first model in the range was a 28” set with a built-in video cassette recorder, loosely based on the BeoCord V 8000. The television section was completely new and included all the features and refinements available at the time. To complete the package, a pair of “active” loudspeakers were built into the cabinet, similar to but slightly larger than those of the Beovision MX 7000. Text copyright © Beocentral. Unauthorised reproduction prohibited. The widescreen tube was by its very nature large and bulky, and difficult to house in a traditional slimline B&O cabinet. To avoid the set looking bulky and awkward, B&O reverted to the “console” style of presentation. By allowing the section that housed the screen to protrude quite considerably, an impression of slender elegance was somehow created. The main upright section of the cabinet, referred to as the “wall”, was made of compressed cardboard and finished in high-gloss pearlescent car-type paint of a choice of colours. Fibreboard sections inside held the various assemblies in place, and the whole set was supported on a motorised turntable. The tube surround was of black plastic, and the screen was protected by a curved plate of glass treated with an anti-reflective compound. Text copyright © Beocentral. Unauthorised reproduction prohibited. Switching on the set, using either the Beo 4 remote control or the concealed push-buttons behind the LED display at the top of the set, treated the viewer to what seemed to be the same “curtains” as the featured on the AV 9000 monitor. This was in fact illusionary as the effect was created electronically by progressively revealing more and more of the scan, which in the end turned out to be a far more satisfactory arrangement as there was no mechanism to wear out or go out of adjustment. Text copyright © Beocentral. Unauthorised reproduction prohibited. When the set was launched, there was no specific agreement as to the standard for widescreen transmissions, so the viewer could choose which format to use. These ranged from a conventional 4:3 presentation which resulted in a rather small picture surrounded by acres of oppressive black, to various widescreen modes that either stretched the picture and made people look fat, or blanked off the top, bottom or both. This was not a problem unique to B&O, and there was little that could be done about it. Text copyright © Beocentral. Unauthorised reproduction prohibited. Having a large screen did help with the menus though. Instead of overlaying the text on the picture, the menus were made large and clear, and a smaller picture was displayed in the remaining area. The menus worked very well, and were optimised for rapid operation with the Beo 4 remote control. Text copyright © Beocentral. Unauthorised reproduction prohibited. The video recorder was installed very discreetly, with only the cassette flap being visible. The only controls on the set itself were limited to three buttons behind the display: one to start the tape, one to rewind and one to eject it. This was enough for basic operation, since adjustments such as tape speed and tracking were automatic. Full operation of a good range of functions were available through the menus using the remote control. The video recorder received some criticism for its poor picture quality and modifications were made as an attempt to cure it. Despite this, the quality was never as good as that offered by the VX models or the AV 9000 system. Text copyright © Beocentral. Unauthorised reproduction prohibited. The BeoVision Avant was intended for full integration into a Beolink system, and included a Master Link connector to interface it to the other equipment. The excellent amplifiers and loudspeakers were well suited to this role. The set could also be customised with optional modules, which would eventually include a satellite receiver, PIP unit, Dolby Pro-Logic decoder with Powerlink outputs and a controller for an external satellite receiver. Text copyright © Beocentral. Unauthorised reproduction prohibited. The sets were very successful, and despite the unusual cabinet and the high price they sold well. Reliability was also quite reasonable, though the fragile VTR mechanism let the side down a bit. A few months after launch, production had to be suspended because of problems with the tubes, though this was rapidly solved. Text copyright © Beocentral. Unauthorised reproduction prohibited. The BeoVision Avant range was updated with a new chassis that offered 100Hz vertical scanning, which reduced the flickering of the picture. Although the reduction in flicker was an improvement, the digital processing required coarsened the picture slightly, so the benefit was dubious. The original BeoVision Avant was finally replaced with the BeoVision Avant 28 RF when new “real flat” picture tubes were fitted, and at this point the cabinet was restyled and the chassis redesigned. Text copyright © Beocentral. Unauthorised reproduction prohibited.